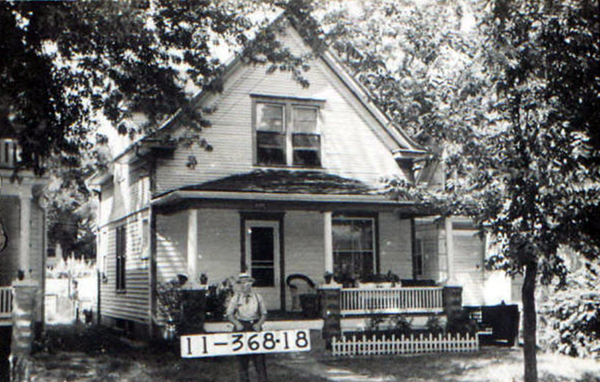 Irish immigrant Cornelius Flaherty, his wife Mary and brother-in-law Patrick Fitzgerald lived in this Volker home from around 1920 through the 1940s. Cornelius worked as a foreman at the stockyards and Patrick repaired cars for the Rock Island Railroad. They had all been born in the Irish Free State, but had come to Kansas City to start new lives. This photo shows their home at 4012 Holly. 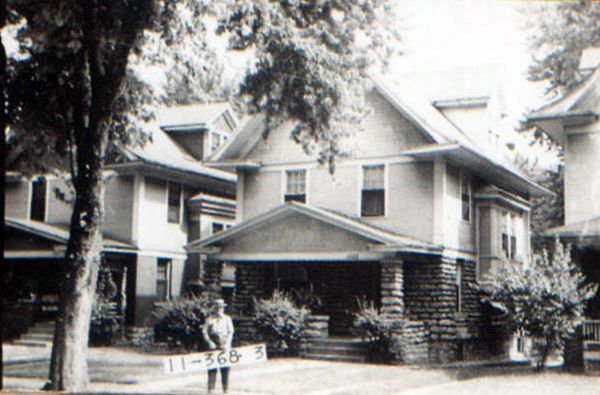 Most of the homes we now occupy in Midtown were built in a relatively short period – from 1900 to about 1920. While some of Kansas City’s wealthiest families had moved south in in the 1880s, the majority of homes were constructed to meet a rapidly-growing population after the turn of the century. For example, the homes on this Volker block between Holly and Mercier from W. 40th and W. 41st were built around 1910, part of a subdivision called Quimby Park. They quickly filled up with families, often new to Kansas City, often immigrants or the children of immigrants. 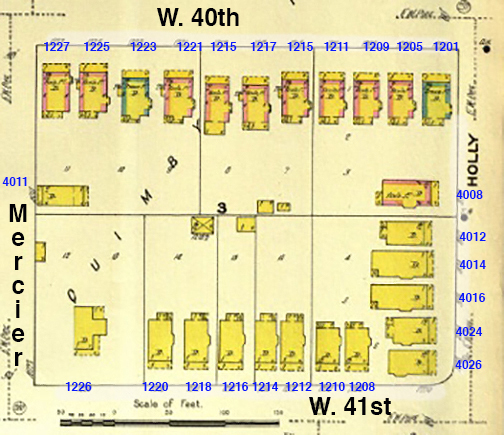 A 1909 Sanborn Fire Insurance Map of the block. Development of the block got off to a slow start. The area was actually platted, or divided up into individual lots, in the 1880s. During that period, Kansas City was undergoing a great housing boom as the population increased dramatically. But by 1888, the housing bubble had burst and many newly-named subdivision like this one often sat empty or contained a few few hastily-built homes. It wasn’t until 1910 that the housing market swung back around and the homes in Quimby Park were built. One at 1225 W. 40th went on the market in 1907, with a price cut from $5750 to $4750. The builders advertised the new home as nine-room brick and frame, strictly modern and up to date with oak finish and a combination gas and electric fixtures. More of the cottages along 41st Street as well as the 2½ story structures on 40th and Holly Streets were either for sale or rent by 1910 and 1911. And a number of new families moving in were searching for women to help them with the housework; even relatively modest households in those days could afford some hired help. The 1910 census offers a snapshot of the earliest residents of the homes on this block. A number of them were either immigrants or the children of immigrants, and they came from Ireland, Germany, Canada, and Switzerland, part of a great influx of immigrants that came to Kansas City in those early years. 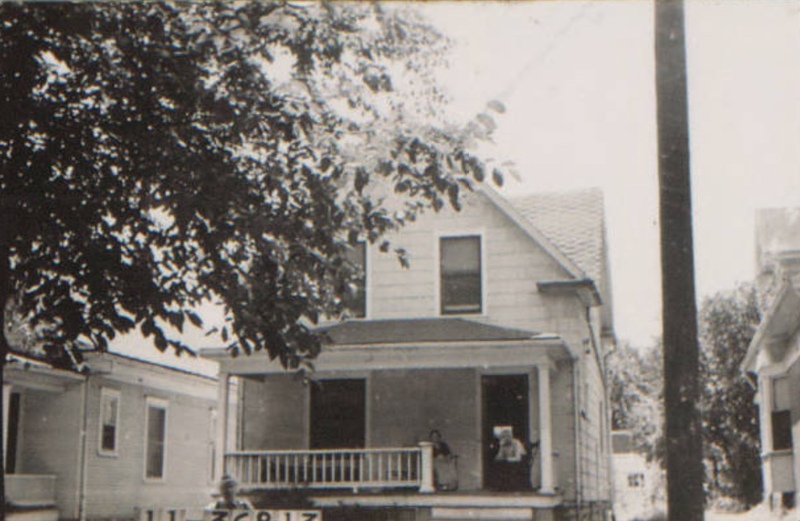 One of the cottages on 41st Street as it looked in 1940. 1225:William Lade, 37, a plumbing department credit man; wife Evelyn, 33; daughter Kathleen, 10. William and Evelyn were both born in Canada. 1223: Phillip Defries, 56, a lumber yard laborer; wife Caroline, 56; son Andrew, 33, a railroad office clerk. Phillip and Caroline were the children of immigrant German parents. 1217: Edward Heins, 28, a packing house contract buyer; wife Elvina, 25; daughter Virginia, 3; daughter Elvina, 0; white servant Carolyn Wolf, 19. Wolf was born in the US to German immigrant parents; Edward’s father came from Germany as did both of Elvina’s parents. 1211: Orland Bone, 38, a livestock commission cattle buyer; wife Clara, 34; son Robert, 0, and a white servant, Claudia Bowman, 25. Clara’s mother was born in Germany. Another of the homes on 41st Street. 1209: Widow Mary McNerney, 51; daughter Lulu, 26, a lumber yard stenographer; daughter Margaret McNerney, 24; son George McNerney, 19, a typewriter foreman; Thomas McNerney, 22, a typewriter traveling salesman. Mary was born in the United States to Irish immigrant parents; all of her children had a Canadian father. 1205: Elroy Parker, 24, transfer company; wife Lena, 22; mother-in-law Martha Hinshaw, 57. 1201: Joseph Murphy, 39, a horse and mule dealer; wife Maud, 38; son Thomas, 18. Joseph’s parents were Irish immigrants. A home near the corner of Holly and 40th Streets. 4008: Charles B. Ward, 21, a newspaper reporter; sister Minnie, 37; brother Earl, 18, a grocery store clerk. 4012: Jess R. Henrie, 29, a paint company salesman; wife Edith, 28; and two step-daughters, Gladys Garrett, 9, and Olive Garrett, 7. 4014: Way Mitchell, 40, a railroad office clerk; wife Ida, 36; and two boarders, Charles L. Hazel, 25, and Edward Jackson, 25, both railroad office clerks. 4016: Newton Davis, 29, a mail carrier; wife Florence, 19. 4024: James Quisenberry, 33, a Christian Church minister; wife Laura, 33; son James, 3; daughter Mary, 6. 4026: James M. Wade, 72, a landscape gardener; wife Mattie, 62. 1208: Christian Minsch, 66, worked in construction; wife Margaret, 58; daughter Elma, 18; son-in-law Carl A, Wishropp, 25, a city water works supervisor; daughter May Wishropp, 23. Christian was born in Switzerland and Margaret was the daughter of Irish immigrant parents. 1216: George L. Thomas, 40, an implement traveling salesman; wife Mary Belle, 34; daughter Nita, 9; father John, 95. 1220: Samuel McConnell, 36, a Western Union telegrapher; wife Nellie, 33; son Robert, 10; son Samuel, 8. 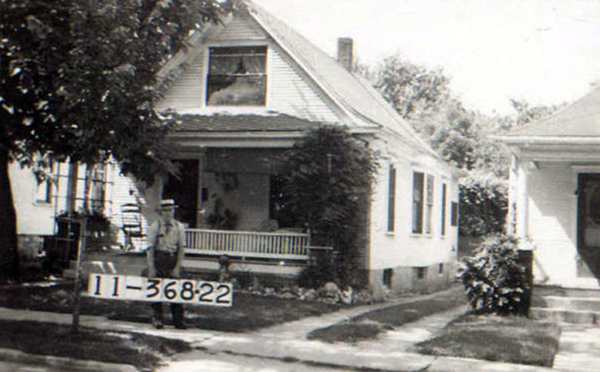 The slideshow below shows the homes on the block as they looked in 1940. Fascinating. My grandmother immigrated from Austria in the 1890s and my grandfather immigrated from Ukraine (then part of Russia) during the first decade of the 1900’s.